Stephen King just celebrated his 71 birthday this past Friday, on September 21. In honor of the horror legend, Fright-Rags is unveiling a new Stephen King Birthday collection, which will have any fan of the author's salivating like an insane asylum zombie. The company is also showing off a few other collections today that include the cult Halloween hit Trick 'r Treat, those infamous General Mills Monsters, and the horror documentary Haunters: The Art of the Scare. "It may not be October yet, but the Halloween season is already upon us. Set the spooky scene with Fright-Rags' new apparel from Trick 'r Treat, General Mills Monsters, Stephen King, and Haunters: The Art of the Scare." Fright-Rags has launched Frightville Novelties, a new line of die-cut decorations. The inaugural line is dedicated to Trick 'r Treat, featuring one large (14x16) and six small (8.5x10) double-sided, vintage-style Halloween decorations. A new Trick 'r Treat shirt, plus a re-print of a classic shirt and socks, are also up for grabs. General Mills' monster cereals have hit the shelves, and Fright-Rags has a General Mills Monsters collection of its own. There's a retro newspaper ad shirt, a Breakfast Club parody shirt, and enamel pins of all five mascots: Count Chocula, Boo Berry, Franken Berry, Fruit Brute, and Yummy Mummy. 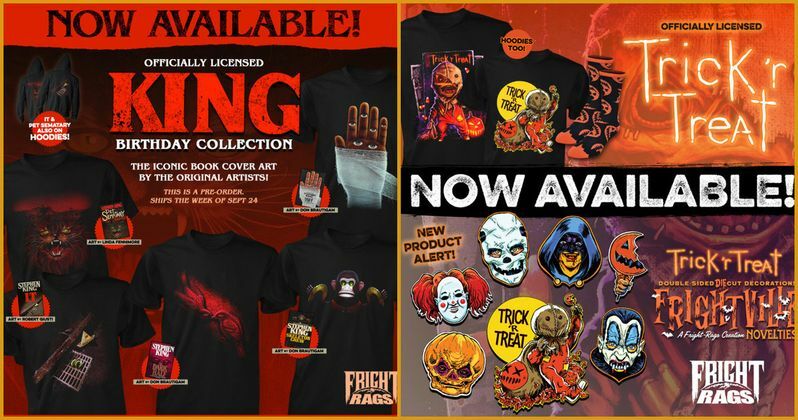 Fright-Rags celebrates Stephen King's birthday, the esteemed author turned 71 this month, with apparel featuring five of his classic book covers. The company worked directly with the original artists to release the artwork for Pet Sematary, IT, The Dark Half, Night Shift, and Skeleton Crew on T-shirts. Pet Sematary and IT are also available on zip-up hoodies. With haunted houses beginning to open their doors, Fright-Rags has put the official artwork for the haunted house documentary Haunters: The Art of The Scare on T-shirts. Enamel pins featuring the film's logo are also available. General Mills Monsters, Trick 'r Treat, Stephen King, and Haunters: The Art of the Scare collections are on sale now at Fright-Rags.com. October will be the Month of Myers at Fright-Rags, with merchandise from Halloween (1978), Halloween (2018), Halloween II, Halloween III: Season of the Witch, Halloween 4: The Return of Michael Myers, Halloween 5: The Revenge of Michael Myers, and Halloween: The Curse of Michael Myers.